As most teachers have headed back to school for the past two days for week 0 to prepare for their first week I have been thinking about all the things that seem to happen in those first few weeks. Sometimes those things are quite unexpected. In my first year teaching in a class of my very own I had it sprung on me that they would be going swimming in week 2 - that gave me one week to get the forms out and back with payment - absolute nightmare for myself and parents. The other thing I detested was just how useless that week became - the kids went at recess, got back after lunch...and were exhausted. What is a teacher to do? My way of getting some learning out of the week (I know swimming skills are very important...but the classroom work must go on!) 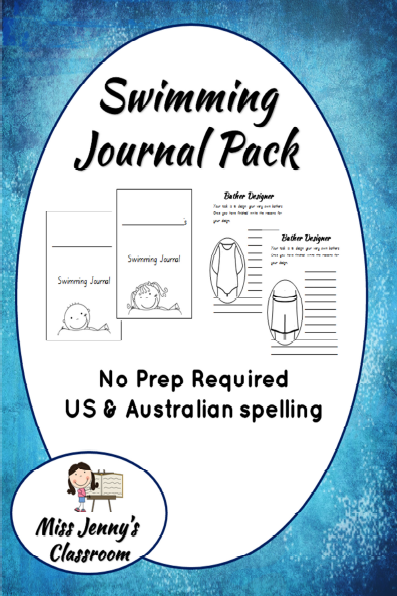 was to create a swimming journal. My first attempt was extremely basic - a cover (one for the girls and one for the boys), four identical pages about what they did with room for a picture and a review sheet for the last day. Hmmm, not that exciting but the students did like it. Having a bit of time on my hands yesterday I decided that the poor journal needed a serious make-over. I kept the pages I already had (there was nothing wrong with them - just a little repetitive) and added some new ones. The first page I added was what gear they needed to bring! No matter how many times you cross your fingers in hope there will always be a student who forgets their towel, goggles, or underwear! With room for them to draw a picture my goal is for them to remember (and not rely of their parents so much). I also added a page for safety and my favourite are the bather designer - get the students being creative with colour and patterns. You think this sounds good? The old version was one of my best-selling items on TPT and I hope that everyone will love the updated, new and improved version - and find it a great time-saver! I love that you are talking about swimming in January!!! Where I live it makes me smile! We are freezing right now! I had seen on the news about the blizzards over there. I wish I could say that it is toasty and hot here but sadly where I live it is still quite cold. I think we've had about a week of hot weather!